The Sony HX1 is an innovative new Super-zoom camera that Sony has loaded with its top lens,imaging sensor and processor as well as its newest and best features. Read more in our Full Conclusion. 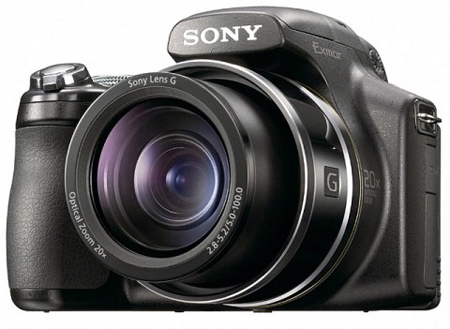 Sony's new Cybershot DSC-HX1 is one of the first Sony cameras to feature their new Exmor CMOS image processor. This sensor is combined with Sony's G-Lens to give you faster speeds and higher quality images, even in low-light. The 20x optical zoom lens gives you a very wide 28mm equivalent view on the wide end, with a distant 560mm magnification at the telephoto end. Handling these high quality features is Sony's BIONZ image processor, which is fast enough, and powerful enough to process all of the information coming from these high resolution images. The set of features included on the HX1 is as good or better than any other camera on the market. Thanks to the innovative processor, sensor and massive zoom of the G-Lens, Sony was able to give the camera the ability to capture video at 1080p HD, Shoot Twilight and Night shots without a tripod, capture 9-Megapixel images at 10fps with a mechanical shutter, features Sony's new Sweep Panorama mode, Saves faces for optimal exposures and numerous other features (listed below). The Sony Cybershot DSC-HX1 is available now with a MSRP of US $479.99.